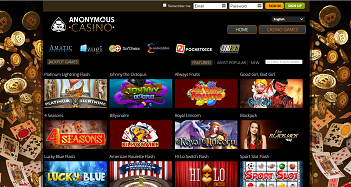 Anonymous Casino was established initially to provide online gamers with a location to access their favourite casino games whilst feeling that their anonymity is taken seriously. This is probably one of the main reasons that it works as a platform offering games for Bitcoin and Litecoin users. But that doesn’t negatively affect its offerings or promotions in any way, as there’s still a fair amount of options available for both of these and more at the site. The platform was opened back in 2014 and it features the full line of SoftSwiss and Amatic Industries slot and table games, all of which are available in an instant play format. Further options have been made available on the site from Ezugi, catering to live dealer games players. Anonymous Casino is fully licensed and regulated in the jurisdiction of Curaçao, further adding to its safety and security for registered users. As a platform, on the whole, the website is constructed in a very user-friendly way. Of course, it’s main feature is that it readily accepts Bitcoin and Litecoin users, so these are littered around the main page, bursting forth from the background alongside casino chips and playing cards, as well as being displayed on the main header banner. Below this you’ll find a variety of options for where to go, starting with the link to the casino. This is joined by the possibility of accessing poker, the live casino or the sports betting site, and each of this sub-sites is laid out with a professional, welcoming design. The platform is also able to be viewed not only in English, but in both Chinese and Japanese as well, catering to a large Bitcoin audience in the region of Eastern Asia. There is little different between a casino of this nature and one that offers more common depositing methods such as credit card or eWallet, in the sense that you can usually find a selection of promotions available to take advantage of. 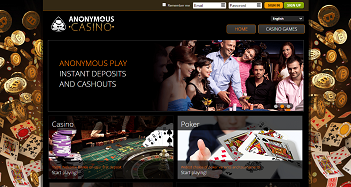 Anonymous Casino doesn’t stray from this, providing new players with its own welcome bonus. This is available to you once you have made your first deposit, and the platform will provide you with a bonus of 150% on top in order to graciously accept you in to its selection of players. This bonus allows you to receive up to 1.5 Bitcoins or 150 LiteCoins altogether. The other two offers that this platform provides are also quite frequently seen across the casino landscape, with the first of these being the ‘Refer a Friend’ bonus. This offers players up to 30% via the affiliate program, meaning that you could be frequently earning extra funds simply by bringing more players to the site. The second is the ‘VIP Club Specials’, although this is still in the ‘coming soon’ stages, meaning that the details of it are still being worked out. However, if there are any high rollers out there, you can be sure that there’s be some special options available for you as a VIP member. As noted, as far as making deposits go, you’re only able to do this by using Bitcoins or Litecoins. The same can be said about withdrawals as well. So, you won’t find any of the more often used depositing methods available at Anonymous Casino, but that’s the whole point. The idea of the platform is to keep players’ details as secure and anonymous as possible, and offering up these two particular methods of making a deposit is a great way of going about that. Of course, this also means that all games are played in the currency of Bitcoin or Litecoin as well, meaning that there’s no possibility of choosing to play in GBP or EUR or anything other than the two mentioned. Again, this is by no means a bad thing. If you’re in need of assistance along your gaming journey at this site, you can very easily access the FAQ section to seek out answers by yourself. Otherwise, there is a contact form, which you can fill in with your email address and question. A representative will then contact you back within 24 hours, which is a bit of a let down on the whole. As noted, this platform offers a strong selection of online games from a few different software providers. As in most casinos, slot games make up the largest proportion of the products offered, with titles available from Amatic Industries, such as ‘Arising Phoenix’, ‘Billyonaire’ and ‘Wolf Moon’. These are joined by other options from SoftSwiss, which provides the majority of the platform’s table games. So, you’ll be able to play a few hands of ‘Jacks or Better’ or ‘Baccarat’, for example. In addition to this, those gamers who enjoy the thrill of a live dealer scenario will be able to access such products, thanks to the addition of Ezugi software. Therefore, you can play on a variety of games with live dealers at hand, such as ‘Roulette’, available in English, Spanish, Chinese, Turkish or Russian, or ‘Blackjack’ and ‘Baccarat’. There’s also the inclusion of games from developer, Endorphina, providing gamers with a few options of more up-to-date slots, such as ‘Chimney Sweep’ and ‘Macarons’. 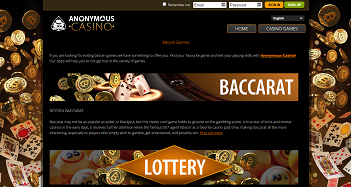 Anonymous Casino does offer up a good location for players to be able to access some of their favourite games with the possibility of funding their account with Bitcoins or Litecoins. For this, it is a nice haven. However, the limited customer support options is a bit unfortunate, especially considering most platforms today offer up a live chat feature.